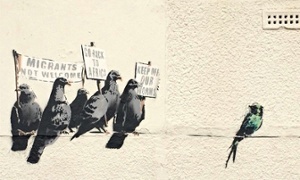 Banksy, to me, is no graffiti artist. He’s a true artist, with a wit and cleverness that, it seems, most people don’t really get. I have been here and used the Underground system, so some of these I’ve actually seen. What struck me was that it felt less like going into an underground system and more like entering some huge cave complex that just happened to have trains! Here is a report on it’s beauty. I originally did this post in June 2014 but it remained in draft for some inexplicable reason. Jean was here for a few days. She had just turned 70 and, for her birthday present, I bought her the ticket to come. The first time she came, about 18 months ago, we did all the things I do, if possible, for first time visitors – Duomo, Duomo roof, Dialogue in the Dark, Villa Necchi. So, what to do this time? Well, although it involved an early start, the day after she came, we went to Venice. I didn’t tell her where we were going and, in spite of the fact that the train was for Venezia, I hoped that Venezia and Venice were different enough for her not to realise. Luckily I was right. She has only started going abroad in her 60s, so is a little more naive than most – but in a good way. We passed Verona (which she had heard of) and the sun was shining. As we approached Venice, the weather was a bit more miserable – fog – and it seemed cold. We got to Mestre, the stop before Venice and the sign said VE Mestre. She asked me what VE stood for and I said it was just part of the name. I said that the weather didn’t seem so good so at the next station we would go back to Verona. When the train pulled up in Venice, we got out (with everyone else, of course as it was the end of the line) but she didn’t seem to notice. I said that we needed to see when the next train back to Verona was. And then I said I had to have a cigarette first. So we walked outside to the front of the station which looks out over the Grand Canal. She cried, which was rather sweet. Anyway, we had a rather lovely day, although, in Venice, there are just too many people/tourists. Living there must be a nightmare! Day two was much easier. I took her to Casa Museo Boschi di Stefano, which is only a short walk from my house. Then we sat at a café on Corso Buenos Aires, then did a bit of shopping, then another café. As we were sitting, we saw one of the sightseeing buses and I asked if she would like to do that for the next day. She replied that she would. After all, we had walked so much in Venice I was a bit worried about over-doing it. So,day three was a trip to the Castle where we caught the City Sightseeing bus. It costs €20 per person and there are three different routes (the €20 covers all three) or you can get a 48 hours pass for €5 more! The automatic guide (you get headphones to plug in) are in a number of languages. We went on two of the routes and, if you’re a first-time visitor, I think it’s well worth it. You get to see all the main tourist sights, can hop on and off at any of the stops to visit something you want to see and/or enjoy the ride. It was the first time I had been and I wish they had had them when I first came to Milan. I’ve put a link to the right (in the useful sites for Milan section). If you come, do it. It’s a great way to see the city. Erm, I’ve just funded a film! It’s almost like I’m a movie producer or something. Of course, I didn’t fund it all. In fact, I funded a little bit of it. You can see the details here (it’s a Kickstarter project). And the film is called Nina Forever. And, I’ll get the DVD and some other stuff. Sometime towards the end of next year. This is my second Kickstarter project – unfortunately the last one didn’t make the target amount so nothing happened, which was a great shame. At least this one will happen. Fuori Salone and walking – a lot. Well, until next Friday, at least. And, for once, F hadn’t really been round the Fuori Salone (effectively the Furniture Fair Fringe) in Milan. The Salone di Mobili (Furniture Fair) is one of the most important exhibitions in Milan. It showcases the new design in Furniture from all over the world and is a huge event. To be honest, the actual Furniture Fair, held at the exhibition centre just outside Milan) is as boring as hell – unless you’re really into furniture design or in the business. But the Fringe, which is held in small showrooms and other places all over the centre of Milan, can be quite interesting. F normally goes round during the week to get ideas and inspiration. This year, it was so cold and wet that he only went to a few places. And so, when Saturday morning dawned and the weather was stunning, he decided to go and visit some things. I and a friend of his also went with him. We walked. And walked. And walked. F was very determined to walk. We saw some stuff which was interesting and fun and great design. And, between shows, we went for an ice-cream in the sun. And then we went to see someone we knew and then we did some more and then we came home. At various places F met people he knew. We went out in the evening for dinner with the friend and some of her friends (who were exhibiting) and had a lovely time. On Sunday morning we took the dogs for a long, long walk and then, in the afternoon, went to another part of the Fuori Salone (which, quite frankly was crap) and then to an opening party for someone we knew who does T-shirts and then to Liù for a pizza. We both agreed that, even if we were tired, it had been a great weekend – which it had. In spite of my legs and feet which were killing me! And, then came Monday morning …………………………. Whereas, for us, in Italy, it’s been a lovely summer with hardly any rain, I know it hasn’t been like that for all of you, particularly those in the UK. So, perhaps for you, this would not be something you can imagine bothering with. However, it is something that I would love to go and see …… and experience. It’s at the Barbican Centre in London (London does do great art) and it’s free. If I go to London before the end of February/beginning of March, I will definitely take a trip to experience it. And, below is the video – but even seeing it on video would not be the same as actually being there. This is something that is no good in print or on video. Hidden Gems that make Milan a special city. There are hidden treasures in Milan, should you be visiting. Some of them are more hidden than others. There has been a link on the right of this blog for the Dialogue in the Dark for some time, and I’ve written about it before, but it’s still worth a reminder. A hidden gem that has become less hidden since it was featured heavily in the film I Am Love is Villa Necchi. It is a stunningly beautiful Art Deco house and should be ‘must see’ on your trip to Milan. When I went there with J towards the end of last year, F couldn’t (and didn’t really want to) come. However, last week he went there and was talking about it for the rest of the week. If you go to the link, make sure click on the slideshow to see wonderful pictures of the house. Another place that is really a hidden gem is an apartment owned by people who collected art – and then gave the apartment to the state so that it could become an ‘art gallery’. It is just off Corso Buenos Aires but so hidden away that you’d never find it if you didn’t know. It is the Casa Museo Boschi Di Stefano. Even better, the one above is completely free – i.e. no charge! The stunning Bagatti Valsecchi Museum, right off Via Montenapolenone has been written about by A Welshie in Italy in her dedicated post and I’m almost certain it is also free! I mentioned here that it seemed, this year, the Italian post office wasn’t doing Christmas stamps. Well, better late than never, it seems they are issuing Christmas stamps after all. Books that should never have been written and films that should never have been made. Of course, it’s all a matter of personal taste. But, you know, there’s some things that just should never have happened. There was a book I read once, a long time ago. It was about a teenage boy who ‘kidnapped’ his babysitter and everything just got a ‘bit out of hand’. I don’t remember the title. I do remember that I truly hated it. Not because it wasn’t well-written (although I can’t remember if it was or wasn’t) and not because the book was horrific or anything – although it was. No, the problem was that the things depicted in the book were such that, if you had imagined them in the first place, in my opinion, you had problems and should see someone to get them fixed. Recently there was something in the newspapers about Human Caterpillar 2 (which, from what I understand, has now been banned in the UK). So I found a copy of Human Caterpillar (the first version – which the protagonist watched in the second version). I’m afraid, not only could I not watch it all the way through, but I had to skip through it, using fast forward most of the time. Not only was it boring and (to me, remember) utterly stupid and pointless but it was also the product of a very sick mind. I don’t know that I could have acted in it (although, on second thoughts, no one has offered me money to act – so maybe I would for the right incentive – after all, it wasn’t actually real, was it?) At the end of it all, it wasn’t a good film but the story did not need to be filmed at all. In fact, should not be filmed at all. Anyway, having seen HC (the first version), even in FF mode, I’m certainly NOT going to be going out to find a copy of HC2. And where is this going, you are (maybe) saying to yourself? Well, over our holidays it’s been mentioned during conversations with others how much F likes going to cinema and how we never do. Apparently this is because I don’t understand Italian and so we don’t go. I pointed out that I have no problem going and, in fact, would enjoy the experience, particularly if I have looked the film up online first so have a basic understanding (and, maybe, have seen some clips in English). Now, I looked at the trailer (as above), I read what synopsis I could find (and because no one would give the plot away, finding the actual important bits was difficult – but I found them) and looked at the book it was based on (online, of course). I knew it would be a ‘difficult’ film and not only because it would all be in Italian! I sat through it all. I’d paid for it, so of course I did. I tried to enjoy the “beauty” of the filming but I was struck, overall, by the same feelings as reading that book and watching that other film. I mean ‘Why make it’? What made him think that this was either believable or good? I wasn’t shocked (although maybe that was because I knew the story beforehand), nor frightened, nor, even, disgusted. I was more than disgusted. It wasn’t a horrible film because it was gory. It wasn’t even a horrible film because of the story, as such. Whereas, for most of the film I kind of understood what was going on – I mean I could follow the idea of the film, even if I didn’t think it was an amazing story, in the last few scenes the whole thing became preposterous. I’d patiently waited for the big twist to happen and then, when it did, I felt that I’d been cheated by an atrocious (and sick and unbelievable) plot. I don’t dislike Almodovar but I left the cinema wondering why he had made it. Worse still (if it is true), F said that he had wanted to make this for years! Put it this way, not only will I not be buying it on DVD, I won’t be watching it ever again.